Welcome to our General Terms and Conditions of Tapi Carpets. Your access to and use of Tapi Carpets & Floors is subject exclusively to these Terms and Conditions. You will not use the Website for any purpose that is unlawful or prohibited by these Terms and Conditions. By using the Website you are fully accepting the terms, conditions and disclaimers contained in this notice. If you do not accept these Terms and Conditions you must immediately stop using the Website. Tapi Carpets & Floors will never ask for your credit card details and we advise our customers to not enter their credit cards details on Tapi Carpets & Floors website or by submitting such details in any other form. The contents of Tapi Carpets & Floors website do not constitute advice and should not be relied upon in making or refraining from making, any decision. All material contained on Tapi Carpets & Floors is provided without any or warranty of any kind. You use the material on Tapi Carpets & Floors at your own discretion. Tapi Carpets & Floors reserves the right to change or remove (temporarily or permanently) the Website or any part of it without notice and you confirm that Tapi Carpets & Floors shall not be liable to you for any such change or removal and change these Terms and Conditions at any time, and your continued use of the Website following any changes shall be deemed to be your acceptance of such change. Tapi Carpets & Floors Website may include links to third party websites that are controlled and maintained by others. Any link to other websites is not an endorsement of such websites and you acknowledge and agree that we are not responsible for the content or availability of any such sites. All copyright, trade marks and all other intellectual property rights in the Website and its content (including without limitation the Website design, text, graphics and all software and source codes connected with the Website) are owned by or licensed to Tapi Carpets & Floors or otherwise used by Tapi Carpets & Floors as permitted by law In accessing the Website you agree that you will access the content solely for your personal, non-commercial use. None of the content may be downloaded, copied, reproduced, transmitted, stored, sold or distributed without the prior written consent of the copyright holder. This excludes the downloading, copying and/or printing of pages of the Website for personal, non-commercial home use only. The Website is provided on an AS IS and AS AVAILABLE basis without any representation or endorsement made and without warranty of any kind whether express or implied, including but not limited to the implied warranties of satisfactory quality, fitness for a particular purpose, non-infringement, compatibility, security and accuracy. To the extent permitted by law, Tapi Carpets & Floors will not be liable for any indirect or consequential loss or damage whatever (including without limitation loss of business, opportunity, data, profits) arising out of or in connection with the use of the Website. Tapi Carpets & Floors makes no warranty that the functionality of the Website will be uninterrupted or error free, that defects will be corrected or that the Website or the server that makes it available are free of viruses or anything else which may be harmful or destructive. Nothing in these Terms and Conditions shall be construed so as to exclude or limit the liability of Tapi Carpets & Floors for death or personal injury as a result of the negligence of Tapi Carpets & Floors or that of its employees or agents. You agree to indemnify and hold Tapi Carpets & Floors and its employees and agents harmless from and against all liabilities, legal fees, damages, losses, costs and other expenses in relation to any claims or actions brought against Tapi Carpets & Floors arising out of any breach by you of these Terms and Conditions or other liabilities arising out of your use of this Website. We aim to always offer you a highly competitive price on all our carpets, vinyl, luxury vinyl tiles or planks and laminate. That’s why we pledge to beat any quote for the exact same, identical products. If you find a high street shop offering a lower totally fitted price for a purely identical carpet, vinyl, luxury vinyl tiles or planks or laminate, underlay and accessories, with the same high level of service, just bring us the quote, we’ll check it and beat it! If you find a high street shop offering a lower totally fitted price for a purely identical carpet, vinyl, luxury vinyl tiles or planks or laminate, underlay and accessories, with the same high level of service, we'll lower our price to beat your quotation. Some high street competitors have a different nationwide shop price to their online price; Tapi Carpets & Floors only sell from a physical shop and not online, so we match our prices to the competitor’s physical shop price only. We also know that some high street competitors have a lower price in specific shops. Where these shops are within 10 miles of a Tapi Carpets & Floors branch, we'll lower our price to beat your quotation. Where Tapi has been asked to make the arrangements for your flooring to be fitted, we agree to act as your agent and for this service an administration fee per m2 is chargeable. The administration includes: introduction to a flooring fitting specialist and arranging the installation of your purchase under a separate contractual agreement between you and them. It also includes monitoring fitting standards, arranging a pre-cut service to aid an efficient and speedy ‘at home installation’, and on the rare occasion of a complaint being raised regarding the fitting, Tapi will manage the complaint between yourself and the fitting partner. We retain responsibility for the products and service Tapi supplies and will act as intermediary between you and the deliverer/ installer should any liability arise from delivery and installation where Tapi made the introduction to the fitter. We keep our prices low by being transparent and not building costs into the overall price of your carpet of flooring. The All Inclusive Delivery & Care package includes delivery, removing and replacing a reasonable amount of empty furniture, removing and disposing of all offcuts plus a complementary tidy up and vacuum. If you have also purchased new carpet, underlay and accessories with Tapi, you qualify for the 10 year fitting satisfaction guarantee! This means we will guarantee you are satisfied with your fitting for 10 years from the date on your invoice. Please keep your receipt as proof of purchase. Carpet must stay in the original location and not be moved or tampered with and should only be used according to our recommendations. Go on! Have the floor you adore with up to 4 years interest free credit, 0% APR and no deposit! Tapi Carpets & Floors can offer interest free options from Barclays Partner Finance on all purchases £500 or over. It's quick and easy and you'll have a decision in minutes! 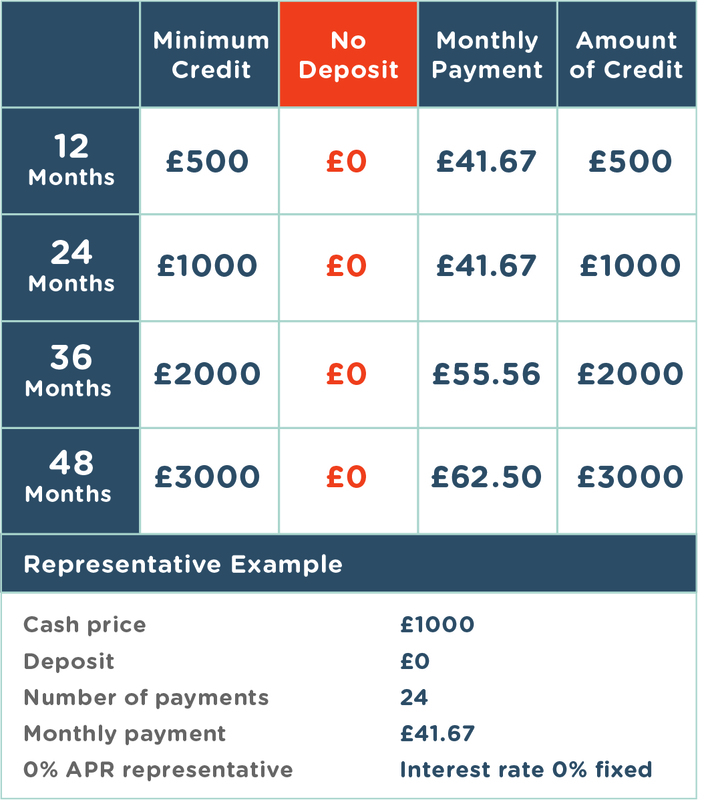 You can choose to spread your payments across either 12, 24, 36 or 48 months interest free instalments. This does not include the cost of fitting your flooring as this work is carried out by 3rd parties. Credit is subject to application and Status. Tapi Carpets & Floors Ltd. acts as a credit broker and not the lender. Tapi Carpets & Floors Limited, Registered Office: 1a Spur Road, Orpington, Kent BR6 0PH, Registered No: 09247255, acts as a credit broker and not the lender. Barclays Partner Finance is the only lender. Tapi Carpets & Floors Limited only offers financial products from Barclays Partner Finance. Barclays Partner Finance acts as the lender. Barclays Partner Finance is a trading name of Clydesdale Financial Services Ltd a wholly owned subsidiary of Barclays Bank PLC. Clydesdale Financial Services Limited is authorised and regulated by the Financial Conducts Authority. (Financial Services Register Number 311753). Registered in England. Registered No: 2901725. Registered Office: 1 Churchill Place, London E14 5HP. The cost of underlay and fitting is included with selected carpets purchases over £14.99m2, that are clearly identified in store and online as the Tapi Bundle.The value of the underlay and fitting has no cash alternative or value. The underlay supplied should be an appropriate square meterage to the carpet and the offer applies to all carpet underlay. Fitting excludes all forms of sub floor preparation, only covers the basic rate of fitting and applies to standard domestic wooden stairs only. Offer excludes fitting to open plan stairs. The Tapi Bundle is not valid in conjunction with other offers, previous quotes and ‘We Beat Any Quote’ price matches. IFC applications will be based on net value of order after saving has been applied. Free fitting available. The equivalent cost of fitting will be shown as discount from your total carpet order and has no cash alternative or value. You will have to pay the fitter directly the discounted amount upon satisfactory completion of the fitting as specified on the invoice. £34.99 Delivery and Care service charges apply. Not valid in conjunction with any other offer. The ''25% off selected carpets when you buy underlay'' is valid on selected carpets when you purchase an appropriate quantity of Tapi carpet underlay with your carpet purchase. The ''20% off Every laminate, LVT and vinyl when you buy underlay or adhesive'' is valid on every laminate, LVT and vinyl when you purchase an appropriate quantity of Tapi smooth underlay or adhesive in conjunction with your laminate, LVT and vinyl purchase. Minimum spend of £250 before offer is applied between 17/04/2019 - 07/05/2019. Excludes fitting costs, the Tapi Bundles, Tombola Carpets, Roll Stock, Remnants and Next collections. Discounted offers may continue past 07/05/2019 and other offers may start in Dunfermline, Edinburgh, Leeds.